I make it in tiny batches because we are empty nesters. 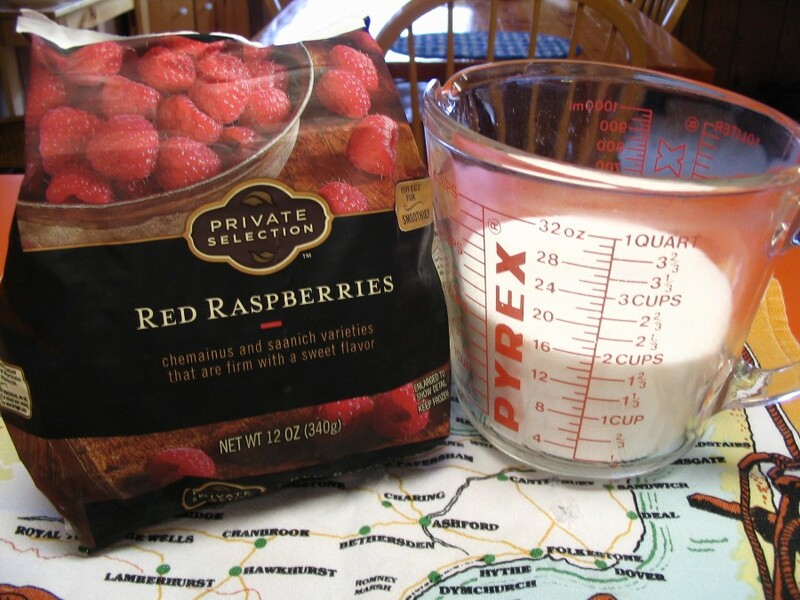 A 12 ounce bag of frozen raspberries (which will give you 2 cups of mashed fruit) and 2 cups of sugar, that's it!! No need to thaw the raspberries. Just microwave them long enough to separate them, then mash them with a potato masher and Measure AFTER they are mashed. Next, measure out 2 cups of granulated sugar BUT DON'T ADD THE SUGAR YET...... JUST SET IT ASIDE. Put the mashed berries in a deep heavy pan and quickly bring to a HARD ROLLING BOIL stirring constantly (see important note at end). Once it's at the hard boil, turn the heat down so that you still have a constant boil, but not boiling crazy hard. Set your timer for 2 minutes, stirring constantly. At the two minute mark, dump in the sugar and quickly bring it back to HARD ROLLING BOIL again stirring constantly. Turn your heat down to a gentle boil and cook for exactly 4 minutes, stirring constantly. Remove from heat and skim off any pink foam you might have (I don't usually have any). Pour the jam into sterilized jars and put on the two piece lid and put it through a hot water bath for 10 minutes. 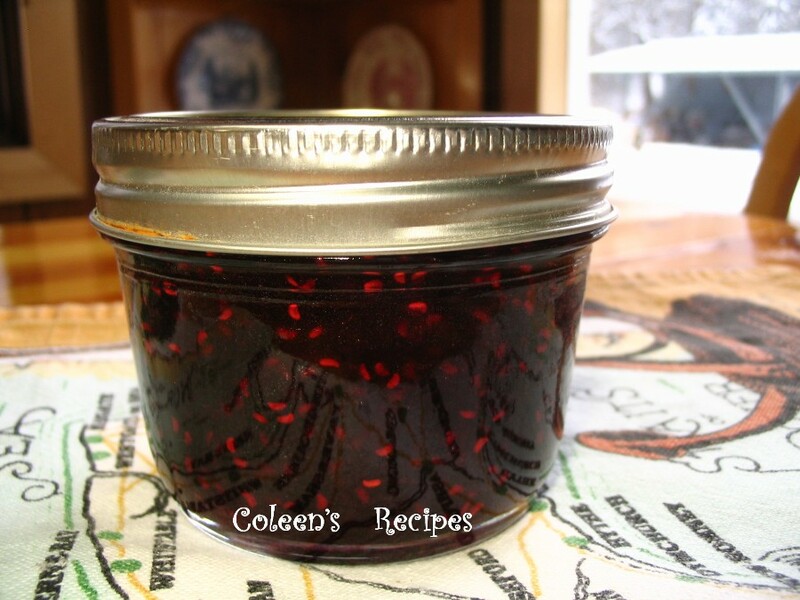 If you don't want to mess with the hot water bath, just store the jam in the fridge. 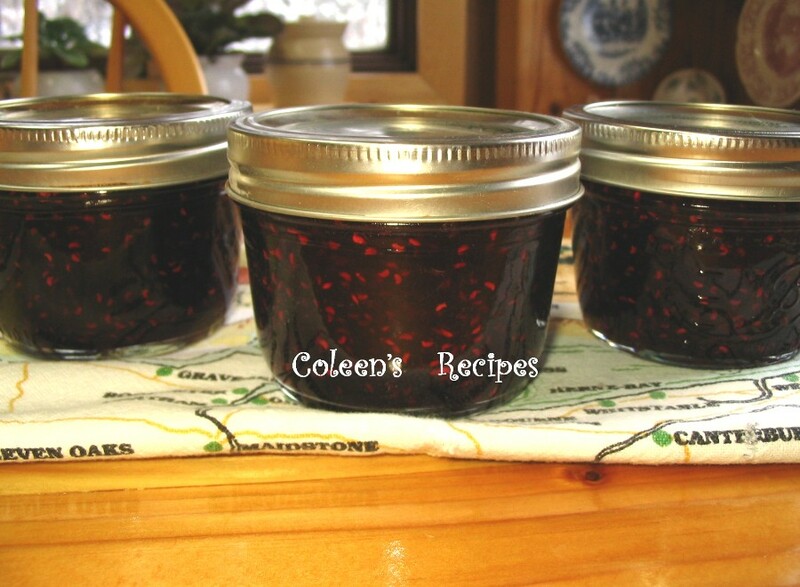 A 12 ounce bag of frozen raspberries and 2 cups of sugar, makes just over 2 cups of finished jam. It is absolutely delicious, fresh and bright tasting, plus it couldn't be quicker or easier. A note about "hard rolling boil". If you are a new cook, don't let this cooking term concern you. A hard rolling boil is simply a boil that doesn't slow down when you stir it. My rule of thumb is to bring it to a hard rolling boil quickly, then turn it down to about medium. What you want is a slow hard rolling boil. Does that make sense? Just don't let it boil crazy hard and you will be ok, just keep stirring.